On May 9, skywatchers on most of the Earth will be able to see such a transit of Mercury. Because this transit lasts more than 7 hours, the Earth will turn enough that parts of the transit will be visible nearly everywhere on Earth except for Australia, New Zealand, Indonesia, the Philippines and a small area of eastern Asia. Observers in eastern North America will be able to see the whole transit, while the transit will already have begun as the sun rises in the western half of the continent. The Mercury transit begins just after 7 a.m. ET and ends just before 3 p.m. ET. On the West Coast, it begins at sunrise and ends around 11:30 PT (2:30 a.m. ET). The exact times at any given location will vary a bit, but a planetarium software program like Starry Night or SkySafari will give the exact times for your location. The other important thing a planetarium program will tell you is exactly where on the sun’s limb to look for the first appearance of Mercury. Unless you know where to look, you will miss the beginning of the event, which astronomers call “first contact.” Second contact occurs when Mercury has completely made it onto the sun’s disk. 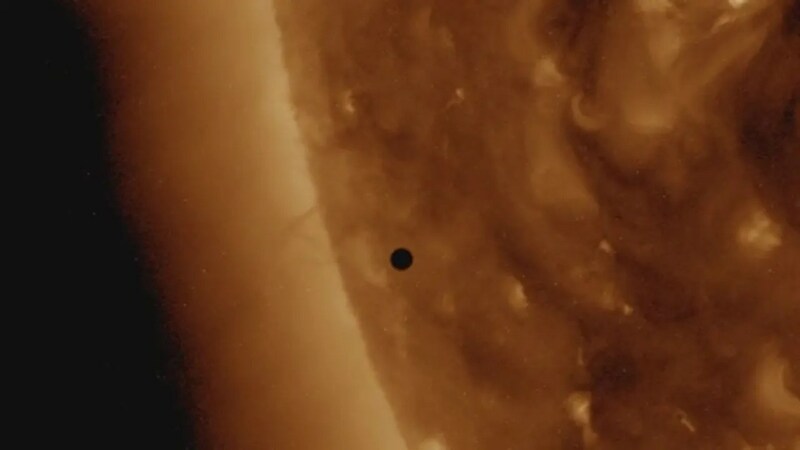 At this point, you may see something called the “black drop effect.” An optical illusion causes the disk of Mercury to appear to be connected to the dark sky beyond the sun by a tiny thread of blackness. You can see this illusion in the first graphic below. The black drop may also be visible at third contact, when Mercury begins to leave the sun’s disk some 7.5 hours later. Fourth contact is when Mercury is completely off the sun. I found while observing the transit of Mercury in 1999 with my 80mm refractor that I needed a magnification of 67x to see Mercury’s tiny disk; 45x was not enough. By contrast, when Venus was in transit in 2004 and 2012, it was visible with the naked eye. If you don’t own a good telescope equipped with a solar filter, don’t despair. Many astronomy clubs will be hosting public viewing events.